Check out the new slideshow widget features. You can now preselect photos and quotes you want to add to the widget and save you widget look-and-feel in Cuesense. Go to Account>Widgets and create a new slideshow. The Edit Photos and Edit Quotes links will be enabled when you choose the Preselected option on the widget front page. 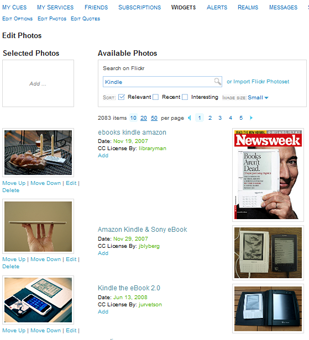 Photos can be added from Flickr via tag search. You can also import an entire Flickr photoset. Choose a sensible photo size that you want to embed in your slideshow, as large photos will take longer to download. Generally, get the size that does now exceed the dimensions of your widget. 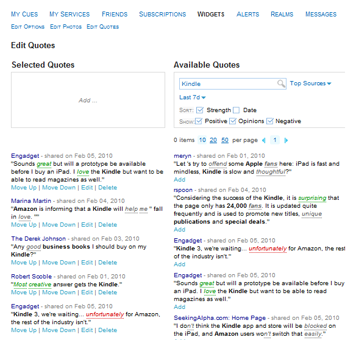 Quote selection works the same way, only here you search by quote intensity score (its expressiveness), emotional orientation (positive, negative, ambiguous/opinion) and date. Move photos and quotes up and down to perfect the flow and check the results in Preview. When you are done, copy the embed code then into your site.